We invent, design, test and manufacture THE MOST Technologically Advanced Electronic Atmospheric Water Generator units called Water Precipitation Generator systems. The best on the planet today with over 35 years making water from the air we are truly the global leader in the Physics of H2O and Its Manufacturing in large and very large scales. More Pure Than Dew drinking water. ALL WHOLESALE PRICES ARE FOR CONSORTIUM MMEMBERS ONLY ! LARGE-SCALE WATER PRECIPITATION INDUSTRIAL SYSTEMS FROM $3,075,000 for 35,000 Gallons a day; To $8,890,000.00 for 150,000 Gallons of water a Day. FROM $589 TO $2,400 + SHIPPING. FOR IMMEDIATE SALE AND DELIVERY. CALL FOR CONSUMER PRICING PLEASE. TERRALAB IS PROUD TO ANNOUNCE THESE HIGH VOLIME 2 PART SYSTEMS . WE ARE PROUD TO OFFER FOR THE FIRST TIME A TOTALLY ADVANCED ELECTRONIC PURE WATER DISPENSER THAT CAN BE COMBINED WITH ANY OF OUR WATER PRECIPITATION GENERATION SYSTEMS FOR THE PUREST WATER ON THE PLANET. THESE DISPENSERS START AT $429 FOR THE TOTALLY ELECTRONIC DISPENSER. Technical Information and Prices are in the new manual download at the top and bottom of this page. We Have many new stand-alone Atmospheric Water dispensers: called water precipitation generators only made by the WBN Global H20 & Energy Consortium with all new 2 part designs, better products, less power, way more water. Due to the incredible Global response for this table-top unit, we are now redesigning this style unit to produce more water with even less power. Thank you everyone for your wonderful response. Atmospheric Water Generator in the next Generation. 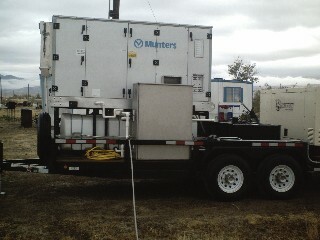 For Disaster Relief 350 gallons of water a day from the air. Drip irrigation supplies not included. For human consumption after filtering. This HYBRID ATMOSPHERIC WATER GENERATOR unit Is small enough to easily fit on the window sill or the top of a book case, or any small green room area. It extracts the moisture from the air and stores it in a spill-proof reservoir. Just plug it in and it quietly cleans and dries the air and can keep your plants watered automatically. All units feature an automatic shut-off switch to shut the unit off when the water reservoir is full. When this occurs, a "full" indicator light will alert you when the reservoir needs to be emptied. A convenient way to keep all the plants in your house watered and healthy with ionized water Made from the Air with Peltier Technology. These units produce water from the air in larger amounts. Price does not include taxes, freight, rigging, installation or electrical. Extended warranty and service agreements are available upon request. · ENERGY EFFICIENCY EPA LISTED. Price does not include taxes, freight, rigging, installation or electrical. Extended warranty and service agreements are available upon request. All units come with 24-7-365 tech support for the life of the unit. Special Atmospheric Water Generator Educational Progams on the Air to Water Science of Air Wells and Dew Ponding along with the Aqua Physics of H20 and advanced maintenance of atmospheric water manufacturing systems & the Physical Science of Atmospheric water generators: learn the truth about these systems that are now available for the first time world-wide as water precipitation generator systems. The next generation in air to water manufacturing, light years ahead of the out-dated atmospheric water generation technology.